Leah Foltz won audience favorite at UC's sytemwide Grad Slam final on May 4, 2017. 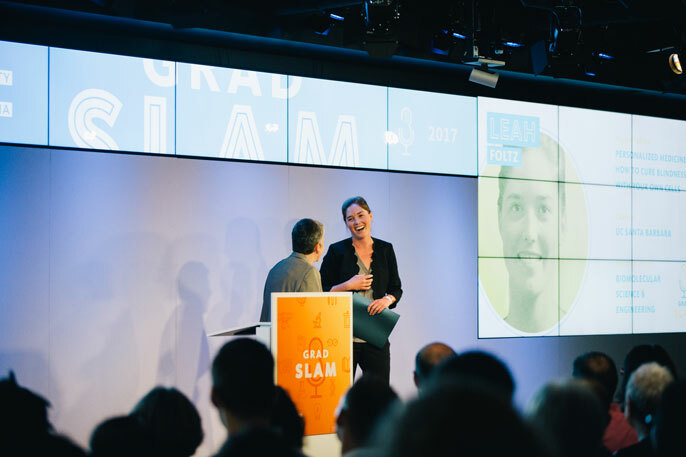 When the standing-room-only crowd at UC Santa Barbara’s 5th annual Grad Slam quieted, Leah Foltz began her three-minute presentation about personalized medicine. But hers wasn’t the usual academic, sometimes dry, explanation. Foltz, a UC Santa Barbara graduate student in biomolecular science and engineering, delivered an engaging summary of recent strides in stem cell research and how her lab uses this biological material to study blinding diseases. Her research explores whether scientists will one day be able to use someone’s own cells to cure their blindness. Foltz’s lively delivery earned her a first-place finish in the campuswide competition and audience favorite during Thursday, May 4's UC Grad Slam final with participants from the nine other University of California campuses. UC President Janet Napolitano emceed the contest, judged by a panel of leaders in industry, media, government and higher education. The event can be viewed at https://gradslam.universityofcalifornia.edu. For the first time, this year’s event featured a $1,000 audience choice award, which Leah won. Foltz was one of 71 UC Santa Barbara graduate students who participated in this year’s campus competition. Each of the nine preliminary rounds produced three winners, two determined by a panel of judges and the third, the “people’s choice,” as selected by the audience. Those presenters went on to the semifinals where nine finalists were chosen. Topics for this year’s finalists ranged from chemical engineering to theater studies, the disciplines from which the two runners-up hailed. Max Nowak explained how he uses models of the blood-brain barrier to study how physical properties, such as size shape and flexibility, affect the ability of a nanoparticle drug to cross from one side to the other. Eric Jorgensen delivered a passionate speech about art as activism and the ways in which live theater chronicles history, citing the corpus of plays that have explored the AIDS crisis. The tournament began in 2012 as an effort to better profile graduate students and to raise their visibility on campus. It has grown into the premier showcase for graduate students in more than 30 disciplines, running the gamut from environmental science, materials and mathematics to art and architecture, global studies and philosophy. Presenters are timed and docked points for exceeding the three-minute limit. To emphasize the actual talk and level the playing field between all participants in terms of resources, visual elements are limited to three slides with no animation, although short internet videos are allowed. Presentations are judged on clarity, organization, delivery, visuals, appropriateness, intellectual significance and engagement.